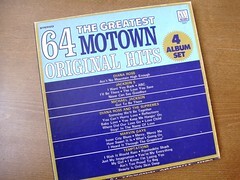 Q: What was Motown’s first hit? Recorded in 1959, Money reached number 2 on the charts. Beatle fans will instantly recognize this song as they did a cover version in 1962 with Peter Best on drums. Interestingly, Berry Gordy, Motown’s driving force and owner, wrote this song, which helped turned Motown into the hit factory it was known for in the 1960’s and beyond. No one guessed the answer, so I am unable to bestow my newly minted award on anyone. Thanks to Rebecca for designing the award. Q: What was Motown’s first million selling hit? This entry was posted in Music History, Music Trivia, R&B and tagged Barrett Strong, Berry Gordy, Motown, Music, Peter Best, rythym and Blues, Soul music. Bookmark the permalink. You can just do a Motown blog and call it a day. Defining a generation, one song at a time and we didn’t even know it. I did not care for this stuff back in the day, but now, wow. Sometimes I have to wonder what I was on….